Loesje is always searching for people that want to support her activities. You can do this in different ways. Loesje is a world wide network of individuals, groups, associations and organisations. 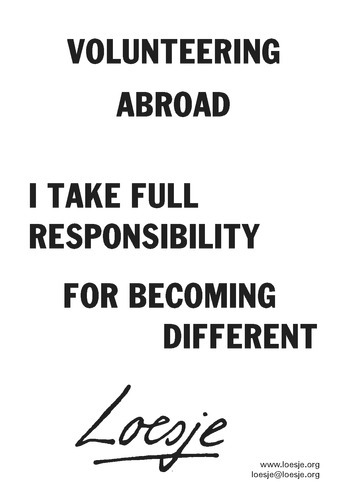 In most countries people work voluntary for Loesje. Most of the vacancies you can find here are voluntary, only occasionally you can find paid vacancies here. Do you want to do EVS in Arnhem at the international Loesje office? We are looking for two creative and motivated people to do European Voluntary Service (EVS) at the Loesje office for 12 months. EVS is a project of the European Commission and it means you can live for free in Arnhem, do society-committed work and enjoy life, if you are under 30. Regulations you can read below. Do you want to work one year for Loesje International in the Netherlands? We are searching for an enthusiastic and creative person to do European Voluntary Service(EVS) for Loesje at the International office in Arnhem, The Netherlands. EVS is a subsidised project of the European Commission and it means you can live for free in The Netherlands, do some useful and fun work for Loesje International and enjoy life (regulations you can read below). The project will start on the 1th of September 2019 and will last until the 31th of August 2020. And it will be a great experience. At our office you will be working together with Lonneke, Luder, Maarten, Meeske, Lotte, Rianne and Ralph and ofcourse many of the other active people of Loesje Netherlands and Loesje International. Accommodation will be arranged. You will get money for food and pocket money and a language course. The atmosphere at the office is informal, fun, busy but with is a lot of space to come up with new, own ideas. Support is present during the whole year yet we encourage self-initiative. An active attitude is essential in the work we do. - Contact with international Loesje groups. - (Co)-organizing events like Summer camp, Congress, writing sessions. - Freedom to think of and carry out own creative plans and initiatives. In all tasks will be a balance between working together and working independently. Loesje-groups, giving workshops to external organisations in The Netherlands. You can apply now but first read the regulations and selection criteria. If you have questions just ask us, no problem. One advice in case you know the people of the office, what you write to us is very important and not what you believe that we know of you. It's better to write more than to give too less information. You should be a citizen of Europe (in the widest sense). If you doubt, ask us! * Because of the strict Dutch immigration policy and bureaucracy, we unfortunately only host volunteer from inside the European Union. The deadline for applying is the 1st of March 2019. We will inform you as soon as possible after these dates if you are selected or not.